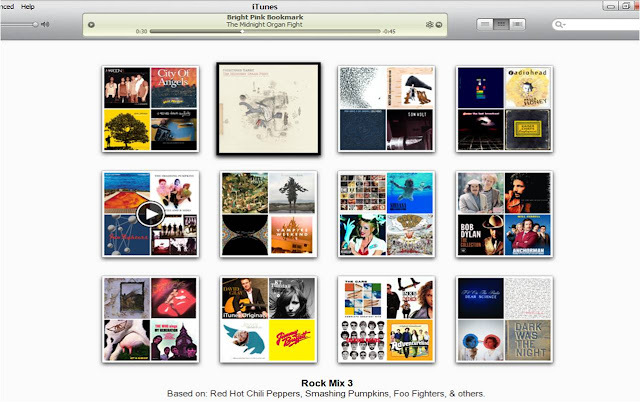 I discovered "Genius Mixes", a cool new feature in iTunes this week. You click on the Genius Mixes in the left scroll bar and it gives you a bunch of different mixes mapped by song type. It's a pretty awesome way of enjoying "Shuffle" and I have to believe they are piggybacking on the huge user database that shows correlations between songs played by other users. I also like the layout with the album covers on the front to show what the mix is all about. Next stop is to let me publish the mix to the web so my friends can hear it. Since we can't do that yet, I made a quick 8Tracks.com mix to give you a sample of one of my mixes. Only drawback is that 8tracks doesn't have all the songs that were on the mix.